Parks Director Jeff Powers with Sara Hartstein, Rachael Davee and Lisa de Graaf at North Albany Park. Benton County is starting to gather ideas about North Albany County Park, which is about to get a 10.7-acre addition in the form of a heavily wooded natural area. They plan to reach out to the public in various ways and invite comments on how the park is used, what if any changes people might want, and how it could be improved for the public’s benefit. 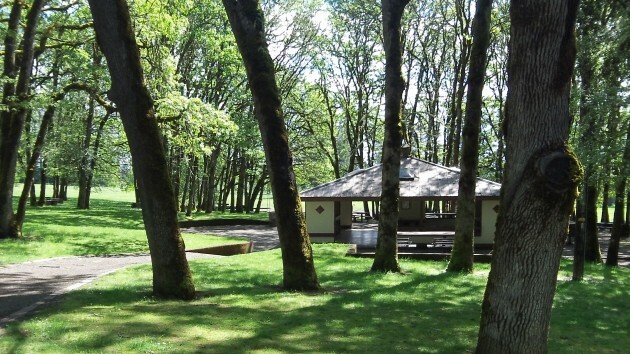 This county park of more than 20 acres features a handsome shelter with sinks and such, plenty of picnic tables, and vast expanses of meadows surrounding groves of oaks and other trees. Now the county is about to take ownership of the wooded parcel northeast of the park, at the corner of Valley View Drive and Crocker Lane. Myles Breadner, developer of a subdivision along Crocker, donated the wooded tract to Benton County as part of a complicated deal regarding street improvements. The county intends to connect its new holding with the park via a trail that will go partially through the subdivision. Then the idea is to loop a walking path through the wooded section, possibly take out some hazard trees but otherwise leave the area natural. Benton County has applied for a state grant of upwards of $40,000 to cover building the trail, probably next year. Meantime, county staffers have begun talking with “stakeholders” about the future of the park itself. A stakeholder is anybody who has an interest in this tranquil place, with its stately trees, open meadows, simple playground and shaded parking lot. 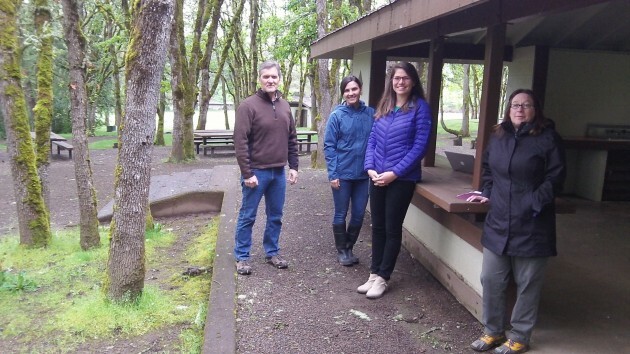 At the park on Wednesday I chatted with four of them: Parks Director Jeff Powers, Parks Operations Coordinator Lisa de Graaf, parks intern Rachael Davee, and Sara Hartstein, a policy specialist with Benton County Health Services. As far as I’m concerned, this park needs no enhancements. If I were a boy living in one of the nearby subdivisions, this would be the perfect place for adventures or games after school. But from the standpoint of park professionals, a few things might have to be done. Accessibility as required by the Americans with Disabilities Act is not as easy as it probably should be. And the county folks are thinking of providing more entrances from adjacent subdivisions. The idea, in line with promoting public health, is to make it easier and even more inviting to use the park for recreation or just walking around. On a sunny day in spring, the area near the North Albany County Park shelter. As a parent of young children who play at the park, I would love to see the actual structure revamped and the gravel gone. We live on the perimeter of this park in a small neighborhood and we drive to Gibson Hill park because North Albany Park is fairly lackluster and the dusty dirty gravel makes for excessively dirty children! Please do not open up more traffic through our neighborhoods. Most people walk in, the parking lot is rarely full. Added trails would be lovely! The bathrooms and cooking structure are second to none! We love those! The park is in desperate need of new play structures. Every time something has needed repair, the county just removed it. It also needs a safe connection to Benton Woods, which has a trail that can take you all the way to the other end of the neighborhood and on to Gibson Hill. All of those nice facilities you mention are in need of maintenance and repair. I would love to see a dog run there. A frisbee golf course would be awesome!! An improved playground would be great! Improvements to the baseball field and sand volleyball court would be wonderful too. I love the idea of a trail through the wooded area. Living next door to N Albany park, our concerns are: 1) The park needs more than one access road. NW Hillcrest Street is not designed to handle all the present traffic, let alone the future traffic use when the park is expanded. Additionally, another access would more easily allow usage of the entire park. 2) Even though the signs say the park is closed at dusk, illegal and inappropriate activity after dark will most likely increase with park expansion and popularity. How will this be addressed and patrolled? I actually think the more houses around it, the more people moving through it at different hours, the less illegal activity. A dog park would be perfect! The only one in Albany is clear across town. Additional playground equipment would be nice and some landscaping renovations would be great, like grass instead of weeds. Add a small water structure for summertime… a cemented area with structures that can spray water. It does not have to be large… perhaps a 15×15 area with organic shaped structures to spray water. Other than that, this place is perfect as it is. I’ve gone there my whole life. Ahhh, Laurelhurst Park. I still remember my first impression of it when the family moved from an eastern concrete jungle. Grass, trees, the pond, geese begging, hills, trails…. Nothing wrong with a nice laundry list of wishes JE. Reality will come crashing down when it comes time to put price tags to each item on the list. A 40k grant won’t go far. However, it is time Benton County put some resources & effort into fixing up their most eastern county park. This is a Corvallis bedroom community…right! The baseball back stop should be replaced or removed. There also needs to be a basketball court and perhaps a tennis court added to increase use of the park. A newer playground structure is also needed. We frequent this park after school with our group of kids and love the seclusion it has with the trees. I feel the play structure is just fine (not all parks need the shiny new primary colored plastic play structures. Keep the more rustic look. We find that people seem to think it is OK to have their dogs off their leashes roaming around everywhere when in fact it is a LAW that dogs are to be on leashes in parks. There needs to be more signs to the leash laws in this park at all entrances which needs to really happen sooner than later. There is definitely room for a dog park area away from the play structures and picnic tables for those owners that want their dogs to roam free.